PocketMac For BlackBerry | BlackBerry Blast! Now you can sync your BlackBerry handheld with your Mac. 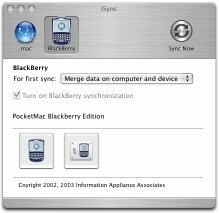 PocketMac BlackBerry Edition is the first program to allow Mac users to sync their crucial data between their BlackBerry and Entourage, Address Book, iCal, Now Contact, Now Up-To-Date, and even Stickies. And it's fully integrated with iSync as well!14 months of hard work, engineering and testing PocketMac BlackBerry means you'll never need a Windows-based PC to sync your crucial data with your BlackBerry. PocketMac BlackBerry Edition takes care of everything for you. Install the software on your Mac in 3 minutes, configure which options you want enabled (Entourage Calendar, iCal, Tasks, etc. ), connect your BlackBerry to your Mac via USB or Serial Cable, and start the sync. That's all that's required. That's literally it. PocketMac BlackBerry Edition is a 2-way sync system, allowing you to sync changes in everything from Contacts to Calendar Events to Tasks to Notes.